If its 500 then we are all good for availability and I am sure the breakers will have bodies and parts for sale if someone just wanted a loaded body. If its 250 make sure to have your favorite stores on speed dial and your Credit Card handy to get in line. Mr Marr has been pretty clear in the past that his requirements for his signature was MIA and "moderately priced" so I don't think he will support a price gouge. IIRC the "moderately priced" option is why he did not affiliate with the custom shop. 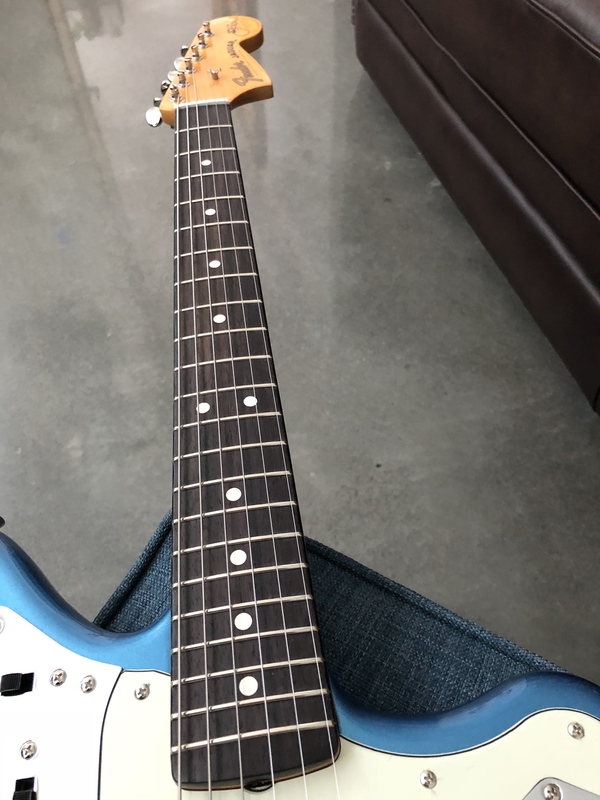 FWIW, Fender told (email) me they made 600 black ones. I thought I saw where Fender was only doing 150 of the LPB version. I had never considered even thinking of the Black JM Jag up until I saw it here with Tort and White pickguards. Why wouldn't they offer the tuxedo look stock? It's tried and true. Were the White and KO ones made in limited quantities as well? I kind of like the idea of having limited colour runs like the way they've done it here, makes it a bit more interesting of a model. I’ve never seen anything about the KO being a limited edition version, and as long as it has been around, if it was, I think it would have been sold out by now. I don't think the Metallic KO was ever limited either. 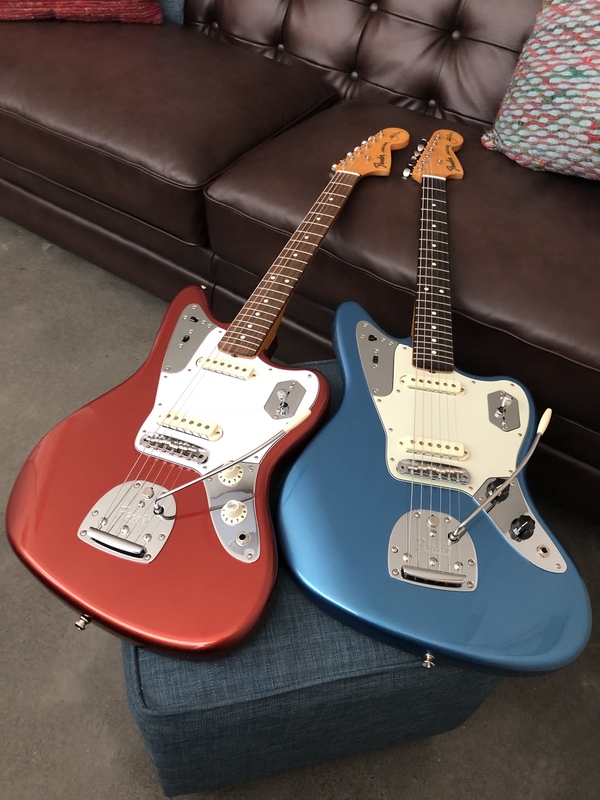 I remember way back when they originally released the JM Jag they showcased the white and KO together. One for the people in the UK, no affiliation by the way. Sounds affects premier have a b stock LPB up on their website for £1799. Very minor defect on it. I'd think about it but recently snagged a used black one for a stupid price. Wanted one for ages but never tried one until I bought this one. Didn't think they could ever be worth the inflated UK prices new that they go for these days, but I have to say having played one that I would pay whatever it would cost to get another if I lost this one. Best jag I've owned without a doubt, and I've owned a few including a pre CBS jag. Well done Mr Marr and co. I'm late to the party. Actually several parties ie a Jaguar, specifically a Marr, this forum and offset guitars in general. I had a grim chuckle when I saw the first post in this thread was 2010 (!) but here we are/I am, new owner of a Marr Jaguar in Olympic White. All things being equal I would have gone for Sherwood Green but you know better than I by now that they are scarce and why. Five years ago - hell, two years ago - if you told me that I would be finished (?) 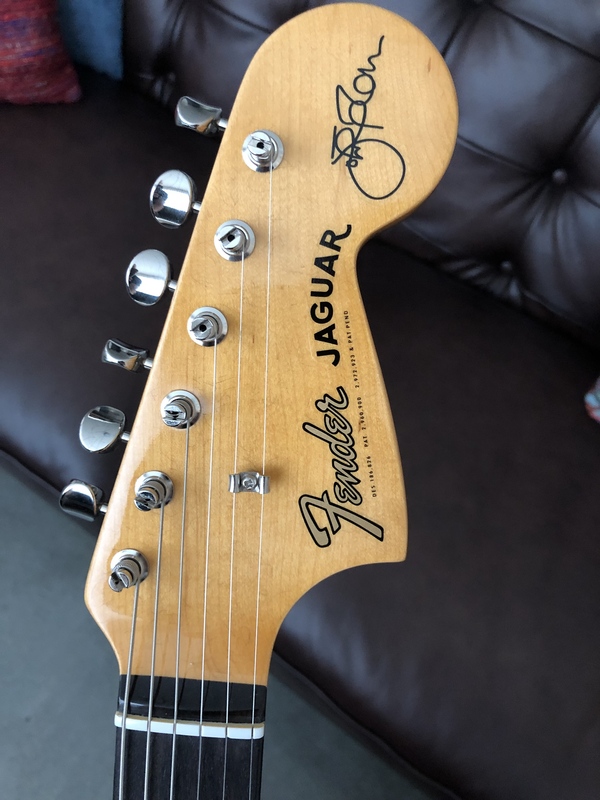 buying Gibsons and Epiphones and that my next electric would be a) a Fender, b) another signature model, c) a Jaguar I would have laughed and said you were crazy. Disclaimer: nothing against Fender before now. I have owned a series of Strats - AVRI, American Standard, and two EJ signature models - still have and play a black EJ. Used to own a Cunetto CS Nocaster. Still don't know why I sold it. But circumstances and tastes change - in my case the purchase was and is the product of joining a straight-up instrumental surf band. They've got the goods in the backline department - '62 blonde Band Masters & Showmans and (reissue) blonde outboard reverb tanks. Also a '65 Blackface Concert. No half measures there - which is understandable since surf music lacks vocals and the sound is everything. It also has a somewhat cult-like scene where fans are typically gearheads themselves and so there was a bit of implied pressure to get a proper surf instrument and they don't get much more proper-er than a Jaguar. However, the Marr angle always intrigued me for the reasons stated repeatedly above in this thread: his compositions and his guitar work and his approach were big influences and, like EJ with his Strat, he had very clear, exacting demands. It seems many signature models are a conglomeration of quirks and/or cosmetics but Marr's focus was on improving the instrument (from his perspective) while preserving its innate character. The now-famous video of him going into painstaking detail ie talking more than playing was quite convincing, as was a guitar magazine interview he did several years ago ie before I ever considered a Jaguar. 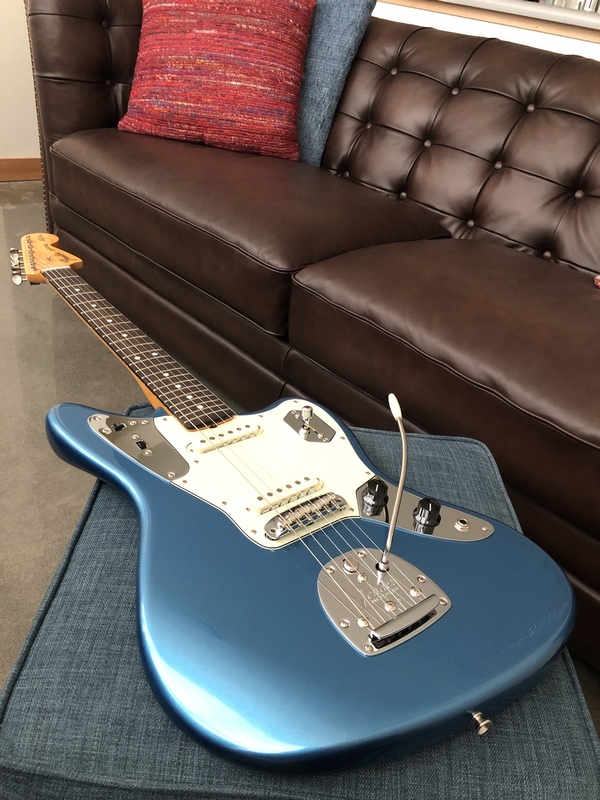 Strictly between ourselves, I'm still somewhat amazed that a Jaguar would become the bread-and-butter instrument for a player (Marr) who played Gibson and Rickenbacker so often but here we are. Full and frank confession: I wanted to keep the ability to play this guitar in other genres 'in reserve' - indie, pop, country, etc. The price for a near-mint instrument was right and, to be fair, while I considered an AV or an American Original (I still lack categorical knowledge of all the models, years and designations) for near-total authenticity in features & tone I couldn't justify the thick end of $2k especially for a brighter, surf-ier Jaguar that might not be as versatile. Mind you, I'm not saying 60s spec Jaguars can't be versatile but context is everything. The Marr's pickups-in-series setting looks to be very handy for non-surf material. In reading this site and retail reviews I was surprised to see frequent mentions of its heaviness, especially for a 24 in scale guitar, and indeed it's noticeably heavier than any Strat or Tele I've owned except for an Am Std that almost had to be 10 lbs for reasons unknown. But I didn't keep that one for long. However, it's not uncomfortable to play standing for long periods. I've been tempted to plaster a pic on social media but keeping things quiet for now as I'll be springing this guitar as a surprise on bandmates next rehearsal. PS - for the full Marr package I had planned to order a Souldier strap with the snowflake type pattern to match his own. On a whim I trudged into Sam Ash in the faint hope of finding something in addition to/instead of. To my surprise & delight they had a Levy strap in stock in the exact same pattern...$30 vs $62 for the Souldier...and Fender are now selling rubber straplock washers for $4. Result! I've said it before, but God, I want a LPB one so I can slap a giant NASA meatball sticker in the middle of the pickguard. Because it would look so damn cool. And I love my green JMJag. 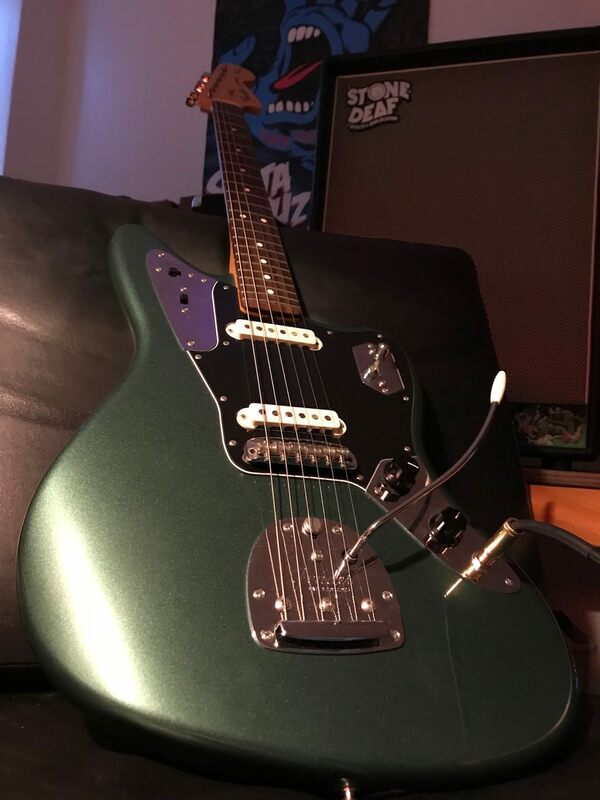 And I love my green JMJag. I went with Spitfire tort. Oh good lord! If you guys ever want to part with your Green JM Jag, let me know! Here’s some pics of my LPB Marrguar. It plays and sounds fantastic. Nice dark rosewood fretboard too. The neck looks like it’s flatsawn to me (looks just like the flatsawn necks I’ve seen on Fender Custom Shop Jags. The neck on my KO Marrguar is birdseye maple. 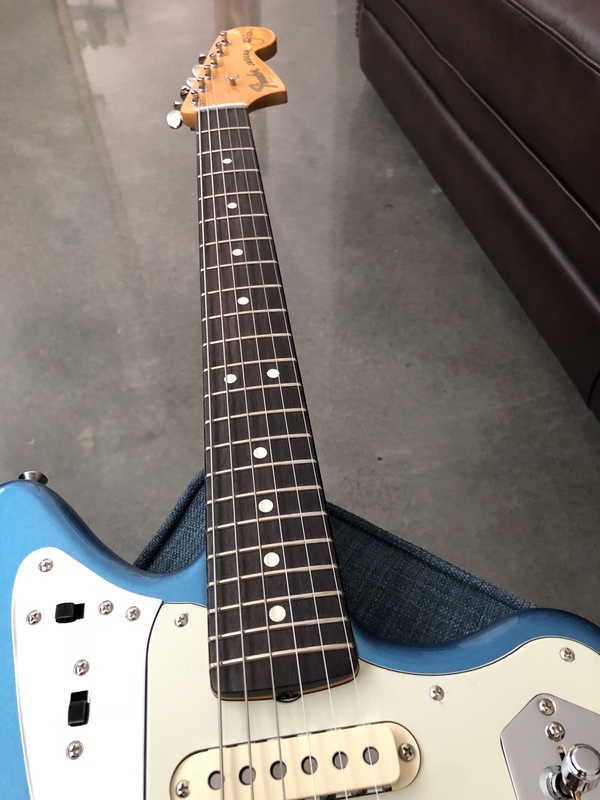 I wonder if Fender has been using some Custom Shop necks on some of the Marr Jags? 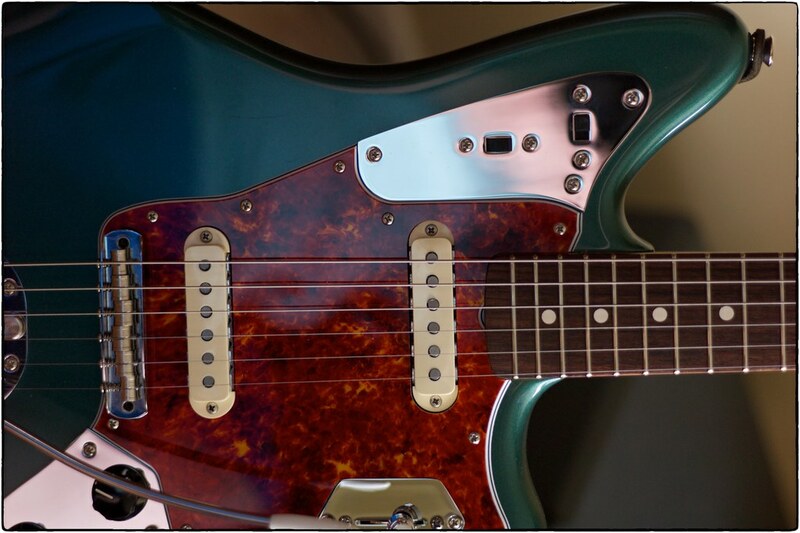 I believe the marr neck has a certain profile relative to a jaguar neck that mr. marr really liked. They don’t make alot of custom shop jags, and the ones they do make usually have a 9.5 radius and 6105 modern style frets.